Practice With Your Favourite Golf Ball For Less! Mix will be a random assortment of DT SoLo, DT Carry, DT Roll, NXT, NXT Extreme, NXT Tour, Tour Prestige, Tour Distance and others. Depending on what stock we have on hand you may get all of these models or just a one or two of them, it really depends on what we have in stock. Postage is a flate rate of $8.50 on these orders regardless of how many practice balls you purchase! Practice With Your Favourite Golf Ball For Less! This is a random mix of all Titleist golf balls. The balls are mainly A and AA grade and will show signs of use. All balls will have scuffs, scratches and possibly pen or logo marks. 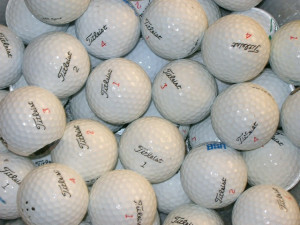 Some balls may be discoloured however no balls will be out of shape or cracked. These Titleist practice balls are great for hitting around in the park and refining your game. There may be some balls in here which will be ok for a round however generally these will be good for practice only Mix will be a random assortment of DT SoLo, DT Carry, DT Roll, NXT, NXT Extreme, NXT Tour, Tour Prestige, Tour Distance and others. Depending on what stock we have on hand you may get all of these models or just a one or two of them, it really depends on what we have in stock. Postage is a flate rate of $8.50 on these orders regardless of how many practice balls you purchase!